The four rhopalia of cubomedusae are integrated parts of the central nervous system carrying their many eyes and thought to be the centres of visual information processing. 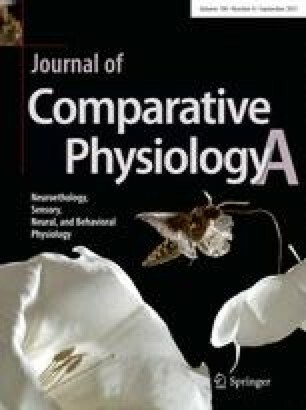 Rhopalial pacemakers control locomotion through a complex neural signal transmitted to the ring nerve and the signal frequency is modulated by the visual input. Since electrical synapses have never been found in the cubozoan nervous system all signals are thought to be transmitted across chemical synapses, and so far information about the neurotransmitters involved are based on immunocytochemical or behavioural data. Here we present the first direct physiological evidence for the types of neurotransmitters involved in sensory information processing in the rhopalial nervous system. FMRFamide, serotonin and dopamine are shown to have inhibitory effect on the pacemaker frequency. There are some indications that the fast acting acetylcholine and glycine have an initial effect and then rapidly desensitise. Other tested neuroactive compounds (GABA, glutamate, and taurine) could not be shown to have a significant effect. The manuscript was significantly enhanced by thoughtful comments from two anonymous reviewers. JB acknowledges the Lundbeck Foundation Grant No. R103-A9339 and AG the Villum Foundation Grant No. VKR022166.